It is official: today we turned on our air conditioner: temperature inside was 82F, outside was close to 90F (30C). I looked at the calendar three times to make sure that last week we switch only clock to the summer time, not the season. No, still March. 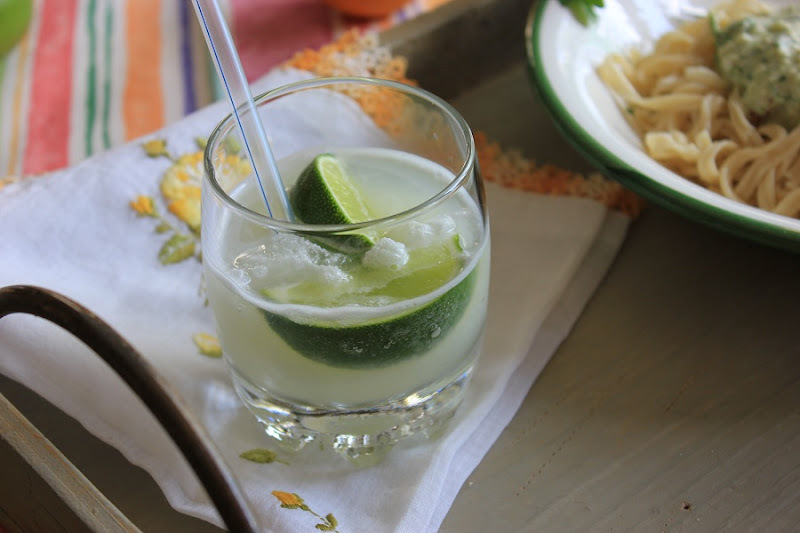 Traditionally I start making a lemonade on Memorial Day. This time mother nature made correction to this routine as well: we were desperate for a cool drink and a spicy meal. 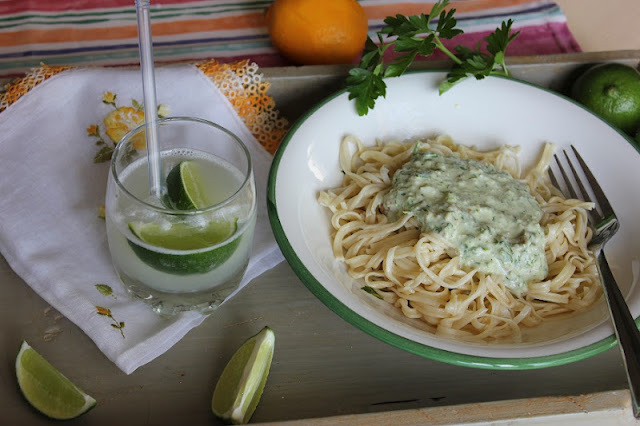 I made a lime lemonade and a pasta with a spicy parsley sauce. Lately I fell in love with all type of garlic sauces, dressings, and dips. This one is one of my latest creations: handful of parsley, a small piece of Pecorino Romano cheese, juice of one whole lemon, 3 cloves garlic, a tablespoon of good olive oil, a tablespoon of veganaise, a handful of walnuts all run through a food processor or a blender. Teenager had it twice! Have you re-discovered a "new" old ingredient? Oh that pasta sauce sounds fantastic. We are definitely big fans of garlic here. Congratulations on that weather; we seem to be holidaying in the wrong corner. Enjoy! I am forever re discovering new old ingredients, especially since I started my blog; here I love to create new with my old recipe. I find lemonades the most refreshing drink for summers. For me they score much above the fizzy drinks. 90 degrees???? WOW! It has been warm here too, but guess what -- it's supposed to snow tonight! haha, I love Colorado weather! Love that parsley sauce - I always buy parsley to use for garnish in photos and then never use it! Thanks for the inspiration! And - is that homemade pasta?? ?